I’m recommending a play on the Xavier Musketeers on Saturday. Xavier is off a tough 3-point OT loss to Marquette on the road. In fact, XU has dropped three of its last four games, but all three losses came on the road. 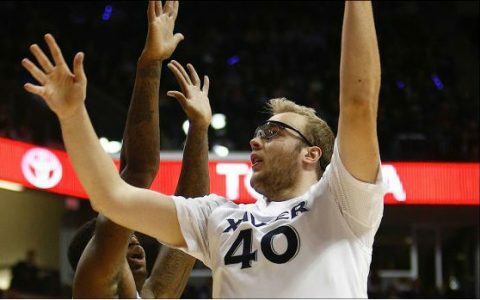 Xavier is a different animal at home where they’re a perfect 10-0 SU (6-3 ATS) on the season. The Musketeers are outscoring their visitors by 18 ppg on their home floor and have been outstanding on the offensive end where they have nailed over 51% of their shots making 29 FGs per game. That’s not good news for a DePaul team that has allowed their guests to make an average of 25 FGs per game on 44% shooting. The Blue Demons have a horrible assist-turnover ratio on the road, averaging less than 10 apg, while committing more than 15 tpg. Not only does XU force teams into a 0.77 assist-turnover ratio at this venue, but they themselves, average over 18 apg and just 11 tpg. DePaul is coming off back-to-back Big East wins, beating St. John’s in OT and last time out, upsetting and shocking Seton Hall on the road. Bad spot for the Demons on Saturday and I’m backing Xavier minus the points. Thanks & GL! Scott Spreitzer. Scott Spreitzer looks to rock the books in afternoon college hardwood action with his DAYTIME MAIN EVENT GAME OF THE YEAR! Scott’s side is in an under-valued spot and backed by a 100% winning situation. The matchups are in place. The line value is in play…Grab the GOY and take the cash!